Today was a BIG DAY! It was the day I got to meet my new NELP class. I can already tell that they're going to be a LOT of fun! I'm really looking forward to having them in class next year. Here are some of the latest photos from NELP! Here are the first graders getting ready for their first debate. Here, a first grade student is doing research to prepare for her 3rd Term final report. Here are the first graders in reading class. Here are the third graders getting ready for their debate. This week, the junior high school first graders are studying "On Colonizing Education" by Chief Canasatego. Chief Canasatego was a Native American Chief of the Onondaga Nation who wrote a letter to the British Colonial administration in Pennsylvania in 1744 regarding the education of young Native American men in Colonial schools. It is an very interesting look at the nature of education. Yesterday, the students had a discussion about the letter, and today, they did small group presentations about education. Some of the students did VERY well, and one group particularly impressed me by being prepared, working together, and staying focused on the task. Some students in the other groups as well did a lot of preparation, but I would like to see some students participate more and prepare more! Last Friday, we talked about the names of Native American nations, and how the names by which some nations are known are actually offensive and show a lack cultural sensitivity to the people of those nations. We also talked about colonialism and imperialism and the problems inherent in using education to replace native cultures with the "dominating" culture of the invaders. That's kind of harsh language, there, I know, but I think it's accurate. The second graders are currently studying the poem "Longing" by Matthew Arnold. My second grade students once again have not only turned in ALL of their homework, but have turned it in well ahead of schedule. They are doing AWESOMELY! They also did VERY well in their small group presentations. However, we did have a short talk in both first grade and second grade about communication and conversation, about listening and responding. I'm hoping to help the students more to develop their ability to listen, think, ask questions and reply. My goal is to have more natural two-way communication in the future! My second graders always surprise me! One student found "Longing" to be "disgusting" because the narrator seems like a stalker: unnaturally obsessing over a woman who doesn't seem interested in him. I find this tremendously amusing because I'd never looked at the poem that way and it opened whole new avenues of discussion and debate. This kind of clever thinking is one of the reasons I love the second graders so much. They're always surprising me! The third graders are working steadily towards the June debate. I'm not doing as well as I wish I were. I'm doing a better job organizing and presenting the debate than last year, but I think next yearI can do much better. I hope to cut even more unnecessary "information" and focus more on the "process" of debate. They've done some VERY clever research, and have had some brilliant ideas, but I'm afraid that they've lost a lot of their confidence in the build-up to this point. Obviously they are in unfamiliar territory in terms of language and skills, and they're feeling distinctly uncomfortable. I can ameliorate (Students, if you're reading this, go look up that word! It's a good word!) this somewhat in the future by doing more practice debates. Due to some lost lessons in the second grade and an absent student in first grade, we haven't yet gotten to our junior high debates, but I hope to do the first ones next week. I did have one big disappointment this week. A student turned in a book report that was taken word-for-word from a review on Amazon.com. I'm SO disappointed. In the past, I've had students copy the 'blurb' from the back of the book. Earlier this year, I received a couple of essays from first graders that were taken largely from Wikipedia. Plagiarism (go look up that word, students!) makes me cringe. Students, plagiarism as an adult can REALLY mess up your who life! People have been expelled from university for doing it! People have lost their jobs and even their whole careers for doing it! People have even gone to jail for fraud doing that! Parents, please talk to your children and make sure to warn them. I mean, honestly, girls: did you think I wouldn't notice that the book report or essay you turned in sounded NOTHING like you? Did you really think I don't know your "style" by now? In more positive news, I've seen some HUGE improvements in some students recently. A first grade student has been speaking so much more fluently, confidently and aggressively in class. Her English level is soaring now! A second grade student has recently also started talking more. Since I changed some of the second grade readings to make the class more balanced, she has reciprocated by being more open and active in class, and her attitude is SO much more positive. As well, a there's a third grade student who's class preparation has become really outstanding. She's really improved in her effort in class. Overall, however, classes are going well, and students are doing well. On Saturday the 5th and Sunday the 6th, I was in Tokyo with one of my first grade students for the finals of the 4th All Japan High School English Speech Contest. There were 18 finalists from all over Japan. It was an AMAZING contest. 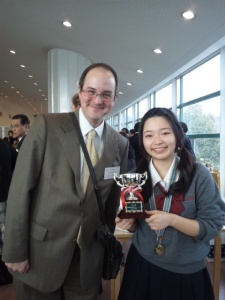 Every speech was a "winning" speech that had won two preliminary rounds, a prefectural contest and an area contest, before coming to Tokyo. I was SO amazed by the quality of the speeches and the skills of the speakers. At this level of contest, it seems to me that winning is no longer about one speech being necessarily better than another, but rather about which specific qualities the judges felt outweighed the others. Every speech, naturally, had some room for improvement, but every speech was so fantastic, and every speaker performed so well, that it was a great experience. By far the thing that I felt was best about this contest was that the contestants had the opportunity to socialize with these great students from around Japan, and it was heartwarming to see the students making friends, eating together, laughing, and at the end, exchanging e-mail addresses and phone numbers, hugging and promising to call or write. I met some really great and interesting teachers, and I hope very much to see them again. My student's mother took this photo! COPYRIGHT(c) 2017 Seishin junior high school , high school. All rights reserved.